Computer role-playing games (CRPGs) are a special genre of computer games that bring the tabletop role-playing experience of games such as Dungeons & Dragons to the computer screen. Thisnew edition inlcudes two new chapters: The Modern Age, and a chapter on Indies and Mobile CRPGs. The new modern age chapter will cover, among other topics, Kickstarter/FIG crowdfunded projects such as Torment: Tides of Numenera and Pillars of Eternity. It'll also bring the book up to date with major games such as Dragon Age, Witcher, Skyrim. Expanded info in first chapter about educational potential of CRPGs. Color figures will be introduced for the first time. gives reviews of hundreds of games across many platforms. 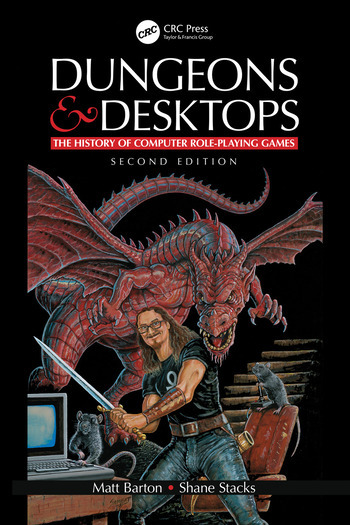 comprehensive book covering the history of computer RPGs. Dr. Matt Barton is a professor of English at St. Cloud State University in St. Cloud, Minnesota, where he specializes in writing studies and digital humanities. He’s authored several books on the history of videogames and produces Matt Chat, a popular YouTube series featuring developer interviews and reviews of new and classic video games. Shane "Shane Plays" Stacks is a talk radio host, podcaster, YouTuber, blogger and recovering elected official exploring the many interests and fandoms of geek culture (of which he considers CRPGs a very important part). You can listen to his weekly Shane Plays Geek Talk radio show live over the air in Little Rock or catch the podcast edition online.